WHAT IS A TRUST? A trust is a specific type of legal entity or company that has been is use for centuries. In the middle ages, when Knights and noblemen in England headed off to the crusades they needed a legal way to make sure there family and property were taken care of in their absence or in case they never returned. Thus, the concept of a trust was established and has been a part of our laws since then. CREATION OF TRUSTS. The creator of the trust is known as the "Trustor" or the "Settlor." A trust is created by a written declaration of trust, and is then funded by transfer of money or property into the ownership of the trust. Trusts can be and usually are custom tailored to meet the specific needs and desires of the Settlor. Trusts are usually prepared by attorneys because each trust is custom for the situation and there are many types of trusts. The language in the declaration of trust needs to be legally correct and precise to avoid future misunderstanding and litigation. THE 3 PERSONS INVOLVED IN A TRUST. A trust has the Trustor or Settlor, a trustee or trustees who administer the trust, and beneficiaries who receive the benefits of the trust. In many types of trusts, the Trustor may also be a Beneficiary as in a living trust created to avoid probate. The trustee is bound by law to follow the directions contained in the declaration of trust. The Trustor may also serve as the Trustee in some situations. PURPOSES OF TRUSTS. Trusts are used to hold money and property for specific periods of time, and to pay out the money and property according to detailed written instructions. Trusts are used to safekeep money and property and prevent it from being paid outright to your heirs at age eighteen (18). Trusts are used to save estate taxes by "generation skipping." Trusts are used to keep an heir from having the responsibility of handling money and property that he may be unwilling to handle, or that he is not experienced enough to handle. Trusts can also be used to benefit charities by causing money to be paid out over a period of time, rather than all at once. Trusts of certain types can be used for asset protection to keep creditors of the Trustors and/or of the Beneficiaries from reaching the money and property in the trust. Trusts can be used to save estate and income taxes. EFFECTIVE DATE OF THE TRUST. A trust is generally effective when the declaration of trust is signed. However, it can be effective only upon death or at some future event. If the trust becomes effective during your lifetime, it is known as a "living trust" or an "intervivos trust." If the trust is effective only upon your death, it is generally part of your will and is known as a "testamentary trust." CAN A TRUST BE CHANGED? A living trust is typically made to be amendable and revocable during the lifetime of one or both of the trustors. This provides a great deal of flexibility and allows the trustors to change their minds later on. Typical trust amendments are to change the names of successor trustees or to change the amounts and percentages to be paid to the trust beneficiaries when the trustors are gone. Other typical changes would be to put additional money or property into the trust or to remove money or property. Changes have to be carefully made however to avoid misunderstandings and future litigation. Also, the trustors need to be mentally competent to make changes. If one of the trustors is competent and the other is not then there are restrictions on what changes can be made. Improper amendments of trusts, especially where competency is in question, or if there has been undue influence in making the amendments, often lead to lengthy and expensive litigation. A living trust can also be made permanent, i.e. irrevocable. If irrevocable, money and property cannot be removed and must stay in the trust for as long as specified in the declaration of trust. TAX CONSIDERATIONS. A trust which is amendable and revocable is not recognized as a separate entity by the IRS. However, when there is a death of one or more of the trustors the situation changes and all or part of the trust becomes permanent and is required to obtain a tax ID# and file trust income tax returns. In all trust formation, amendment and terminations, one must consider all of the 3 following tax implications: Income taxes, property taxes, and estate taxes. TRUST DOCUMENTATION IS CUSTOM PREPARED. The government and state laws do not require any certain form for a trust to be valid. The state law requirements are minimal: one needs a beneficiary, a trustee and an asset for the subject of the trust. It is up to the parties involved to prepare the instructions for the trust (commonly known as a Declaration of Trust). As with any serious business and property endeavor, the declaration of trust needs to be carefully prepared. 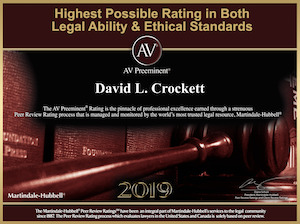 The declaration of trust forms prepared by Crockett Law Corporation take into consideration many, many factors and provisions are added in part based upon our experience with trust litigation. Trust and probate litigation brings out many issues which in many instances of trust preparation are overlooked, forgotten, or not discussed.